Discovered torta al testo at the home of my Umbrian friends. 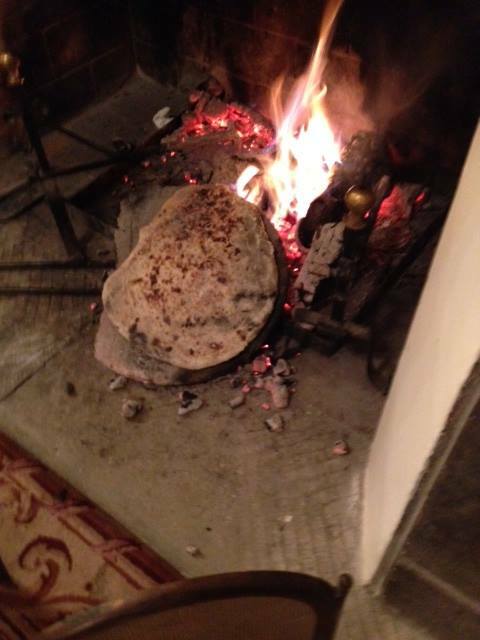 A delicious soft flatbread cooked on a hot terracotta stone or in an iron pan called a testo. It is traditionally made in an open fire giving it an addictively smoky flavor. Totally satisfying, torta al testo can be eaten on its own, like any other bread, or with cured meats like prosciutto and coppa di testa (Umbrian head cheese). Simple water, flour and salt (some recipes call for olive oil or a little yeast) are all that is needed to make a bread that is believed to date back to the Romans and ancient Etruscans. Modern versions are cooked on a stovetop but nothing compares to the flavor and slightly charred appearance of a torta al testo placed directly over the coals left from a wood fire. 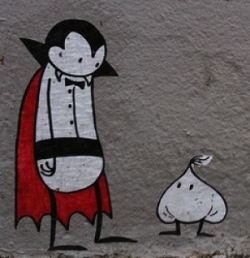 L’ammazzavampiri (garlic canapé) is proported to be so heavy on the garlic that it takes its name from the Italian verb ammazzare meaning “to intentionally put to death” hence the name ammazzavampiri ” vampire killer”. A traditional bruschetta ammazzavampiri begins with slices of pane casereccio , a durum wheat bread from the town of Genzano in Lazio. Outside of Italy any firm, country-style bread sliced about ½ inch thick will do although few will have the chewy, elastic crumb of this pane. Grill, toast or broil the bread until is a deep golden brown. A classic ammazzavampiri has an extraordinary amount of whole peeled garlic cloves rubbed over the warm bread. Then it is sprinkled with coarse sea salt and generously drizzled with the season’s freshly pressed extra virgin olive oil. Serve with an Amazza Vampiri cocktail apertivo to entertain your ghoulish guests this Halloween. Our Italian inspired Halloween begins on October 31 and ends with a two day celebration that goes beyond the traditional treat or treat. In Italy the day after Halloween, November 1st (All Saints’s Day) and November 2nd (All Soul’s Day) are celebrated as feast days to honor the saints and souls of those who have passed on. 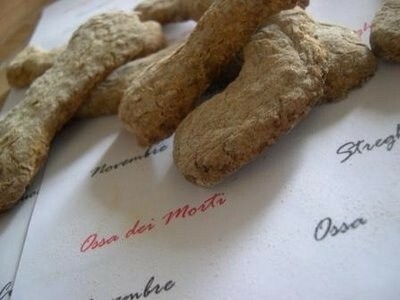 A celebration of life more than death, Italians commemorate the time with Ossa dei Morti, “Bones of the Dead“, cookies whose shape, coloring and texture look like a bone. The ingredients used to make this traditional dolci of the dead vary from region to region. In Lombardia and Piemonte they are made with powdered almond macaroons, sweet wine, dried fruit, chocolate, pignoli, and s pices. In other regions they are a hard meringue biscotti studded with nuts that crackle like crunching bones when you take a bite. Some are seasoned with anise and fennel, others with cloves, lemon or cinnamon. Either way these “bone” cookies are a seasonal treat and a dear and special way to remember those who have gone before us.